The movie that catapulted Benji into international stardom. The #3 movie of the year in its original release. A unique motion picture all told from the heart and soul of a dog. Benji is the gripping story of a vagabond dog struggling to communicate something he’s seen to humans. Humans who need to know but cannot grasp the concept that a dog could possibly help. A story of frustration and persistence, of love and suspense. And the first time ever that a dog has actually acted on the screen. Expressed emotion. And done it so very well that we, the audience, completely understand everything Benji is thinking and doing, every turn and twist, without a word of dialog being spoken. •FIRST TIME AVAILABLE IN HD & ORIGINAL WIDESCREEN ASPECT RATIO! 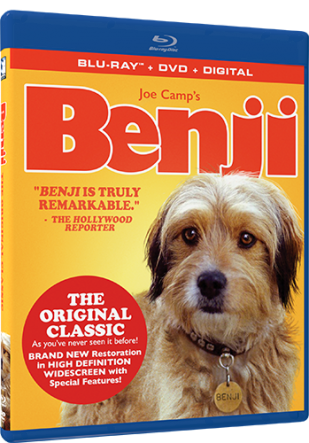 I haven't thought about Benji in years, but as soon as I sat down to watch this film, a flood of memories came back. I can see myself sitting on my mom's lap, holding my stuffed Benji in my arms. In this original film, a scruffy little dog discovers a secret and tries his best to let the humans around him know what is going on. In addition to the original full length film, this Blu-ray set includes a photo gallery, interviews, and a look behind the scenes. This is one of those movies that made a deep impression on me as a child. I think it's what started my obsessive love of animals, and is one of the main reasons why I am still an animal lover today. I haven't seen it on television since I was a kid, so getting the chance to snuggle up with my own little ones to watch it was like coming full circle. Benji is an adorable family film that has brought many generations a lot of joy. Grab a copy for your own family on Mill Creek's website.